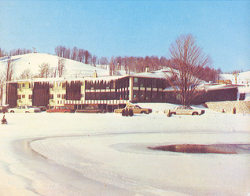 With two distinct ski hills, Shanty Creek offers a wide range of skiing choices. In the last few years they’ve added 40 feet to the top of Schuss Mountain and 12 new slopes and night skiing. Children’s programs featuring Gandy Goose keep the kids happy while they learn to ski. Boyne Mountain is known for it’s convenient lift and trail systems that cater not only to the expert snow enthusiasts but to beginners in a way that makes skiing and riding easier than ever to learn and enjoy. 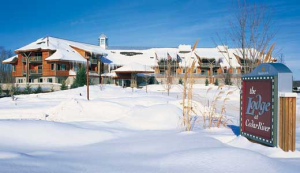 Miles of groomed cross country ski trails, a huge outdoor hot tub and pool, memorable dining venues, warm fireplaces, specialty shops, well organized children’s programs and the famously lively apre-ski scene are just some of the likely pastimes for you to enjoy at Boyne Mountain. International Snowsports School make the fun pleasantly accessible to new enthusiasts and families alike. The thrill seeker will enjoy the Midwest’s most vertical, longest runs, steepest run-The Couloir and our terrain park. Vertical Drops and Slopes as challenging as any ski hill in Northern Michigan. Veteran skiers up north rate Caberfae as one of the best. Hours closer to Southern Michigan, you’ll drive less and ski more at Caberfae. Crystal Mountain seems to do everything right. Quality instruction and children’s programs and top-notch resort amenities and service. A great Nordic Center extends your ski experience to the Northwoods surrounding the mountain. (P.S.I.A.) 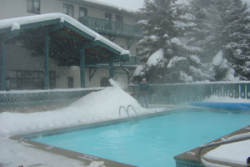 saski school, an unparalleled ski safety record, renowned children’s program, on-site bed and breakfast-style accommodations and condominium and log cabin vacation rentals, the award-winning cuisine, all give Otsego Club an appealing, quality atmosphere. Since 1939, a tradition of families spending time together. JOIN THE CLUB TODAY! 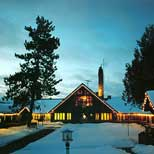 The Homestead offers downhill skiing and boarding with panoramic views of Lake Michigan. Cross-country skiing in the adjacent Sleeping Bear Dunes National Lakeshore. State-of-the-art snowmaking with 100% coverage. Lifts with advanced safety and comfort features. 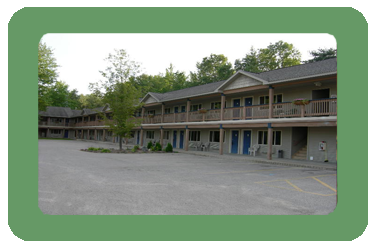 Camp Tamarack children’s center. It is clear to see why northern Michigan attracts thousands of snowmobile enthusiasts each weekend. With northern Michigan’s extensive trail system, abundant snow and exciting terrain, it is the perfect setting for a snowmobiling adventure for all ages. Michigan also offers plenty of lodging and snowmobile friendly pubs and taverns and terrific dining as well. Winter in Michigan is a rich tradition. From Gaylord’s SnowCross 2000 to Tip- Up Town in Houghton Lake, there are plenty of activities all winter long in Northern Michigan. These are just a couple reason why sledders of all ages come to northern Michigan every week to work, play and sled! Michigan is known by snowmobilers nationwide for its unique combination of abundant and dependable snow, exciting terrain, and extensive trail network. Over 6,300 miles of snowmobile trails are located throughout the state in six State Forests, three National Forests, and many acres of privately owned lands. 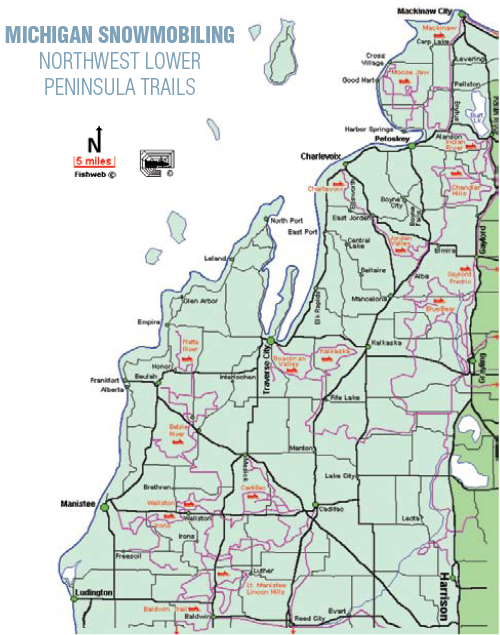 Michigan is one of only three states that offer a large system of interconnected snowmobile trails. Snowmobile safety training is available through the Department of Natural Resources, Law Enforcement Division. More than 100 grooming tractors are used in 4 DNR, Forest Management Division offices and by 61 grants program sponsors to groom the 6,300+ mile trail system. Registration fees and snowmobile permit fees and a portion of the states gasoline tax account for over 6.8 million dollars annually allocated for trail grooming. $500,000-$800,000 is allocated annually for “off-season” repairs to snowmobile trail facilities.